Overheard at a high wheel race, ukulele festival, and insect love-song seminar. “My strategy is to stay on the far right and not die,” says 58-year-old Nick Ackermann, smiling beneath a bushy mustache and protective headgear that resembles a brimless pith helmet. Nearby, two-dozen-plus fellow penny-farthing enthusiasts—many, like Ackermann, in tweed and knickers—climb atop 4-foot tall bicycles, preparing for the 4th annual Frederick Clustered Spires High Wheel Race, the only U.S. competition of its kind. Fittingly, a barbershop quartet performs “The Star-Spangled Banner” just prior to the blast of the starter’s horn, which sends the riders scurrying around the .4-mile circuit, ringed with 5,000 spectators. Proving Ackermann’s point about the danger inherent in navigating a race while mounted on turn-of-the-century-style bikes, there’s a pretty good crash two-thirds of the way through the event. Ultimately, Angela Long, a senior V.P., mom of two, and avid cyclist, racing in heels no less (“The extra inches to help me climb up,” she says) takes the women’s competition. And Eric Cameron, an Air Force biomedical engineer and runner, takes the men’s title, falling just a lap short of the one-hour course record. A novice who just turned 42, Cameron watched last year from a local pub and jumped at the chance to compete when a friend’s husband, who owns a high-wheeler, suffered an injury this summer. “Or my mid-life crisis,” says Cameron, still breathing hard. “Does anybody know what ukulele means in Hawaiian?” Victoria Vox asks the packed beginner’s workshop at the Creative Alliance. Several hands shoot up. “Jumping flea—that’s right,” says Vox, explaining how 19th-century Hawaiians marveled at the quick fingerboarding of migrant Portuguese sugar-cane workers on their native country’s compact instrument. Which, of course, Hawaiians soon made their own, substituting catgut for traditional steel strings. “I’m pretty sure they just got tired of the cuts and blood from those steel strings,” laughs Vox. 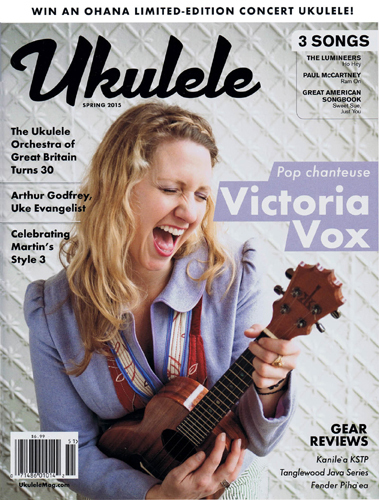 The host of the all-day, second annual Charm City Ukulele Festival, Vox, a Baltimore transplant who has graced the cover of Ukulele magazine and tours extensively, is leading three of the seven uke classes—there’s also a Hula workshop—and performing at tonight’s show. Other ukulelists this evening include Hawaiian-native Glen Hirabayashi, who performs regularly in the region with The Aloha Boys, and Louisa Hall, a Northern Virginia-based songwriter who often infuses her cheerful strumming and pleasing tenor with darker lyrics. Her set includes numbers such as “Irrational Fears,” “Internet Love Song”—a disturbing chronicle of online dating experiences—and “Missed Connections,” an upbeat tune in which she stalks a stranger getting off the D.C. Metro. The volunteer-run Natural History Society of Maryland, which is hard to miss given the replica dinosaur out front, has its unusual collection of taxidermied wildlife, pressed butterflies, and sea turtle skulls on public display this afternoon. But today’s main attraction is a presentation by entomologist Cathy Stragar called Summer’s Singing Insects, about the katydids, crickets, and cicadas that make up the season’s outdoor chorus. Stragar, who works at the Bee Inventory and Monitoring Lab at the U.S. Geological Survey Patuxent Wildlife Research Center in Laurel, explains that many insects make music by a process known as stridulation—or rubbing body parts together at incredibly fast speeds. A male cricket, for example, uses one wing as a plane and the other as a scraper/bow, playing to attract female partners. Cicadas, however, use a different method, popping an abdominal noisemaker called a tymbal, which can produce sounds over 100 decibels. “Males close their ears to literally prevent them from going deaf,” she says. Some grasshoppers, on the other hand, emit supersonic sounds that humans can’t hear. As part of the lecture, the first in a bimonthly series at the Natural History Society, Stragar plays recordings of crickets and cicadas. She notes the local varieties of each as the small but rapt audience nods in recognition of certain familiar chirps and whistles.